The Islands of Tahiti | Noble Studios, Inc.
As one of the top 10 destinations in the world, The Islands of Tahiti has no trouble drawing vacationers to their little patch of tropical paradise. In fact, nearly 200,000 people visited these far-flung South Pacific islands in 2016, representing a 17 percent increase over the previous three years. But even the best of things can benefit from a little improvement. Tahiti Tourisme, the Polynesian country’s official destination marketing organization, sought to drive visitors to more of its islands, including those off the beaten path, while increasing visits to stakeholder businesses in the process. Tahiti also hoped to broaden its reach by expanding its digital presence to 18 different countries. The end goal? To increase the average length of stay by appealing to a more global audience and boost the number of vacation packages sold by tour operators. At Noble, we’re always excited to tackle new projects, but to launch a new site for an entire country with language personalization across 18 regional sites was a really big deal, to put it mildly. 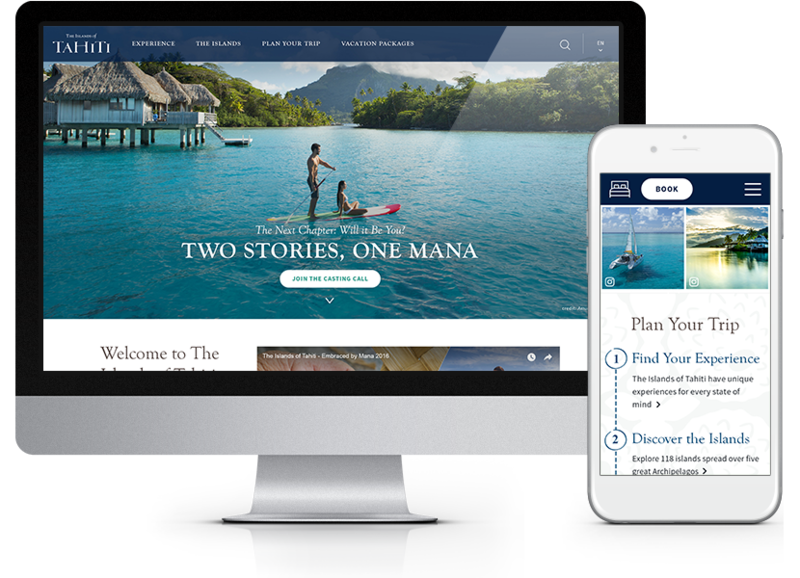 With deep experience in the travel and tourism and digital marketing verticals, Noble Studios took on the task of creating a new website that visually showcased The Islands of Tahiti’s refreshed brand, also giving individual stakeholders more control over their content. 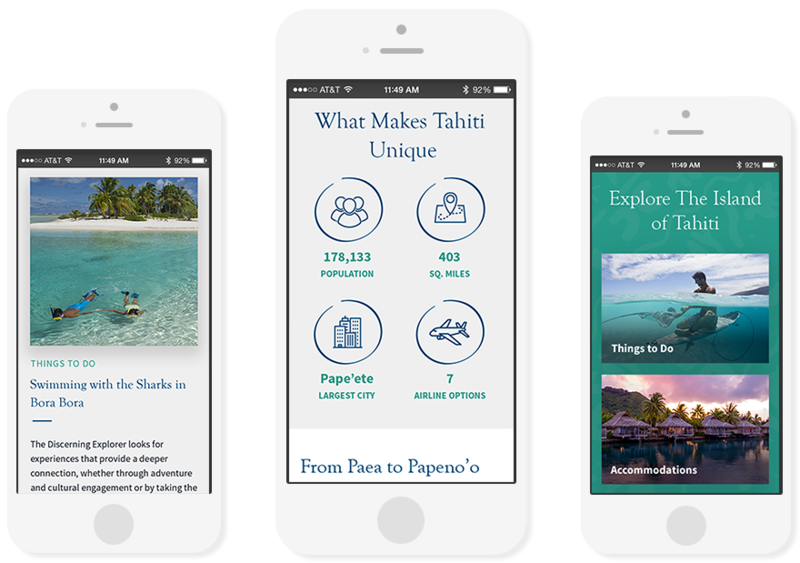 Undertaking nearly a year of extensive planning, research and stakeholder input, we began overhauling the look and feel of TahitiTourisme.com. Inspired by the Polynesian concept of Mana, the life force infused throughout the region, we sought to better educate potential visitors on the cultural and geographic differences found in Tahiti’s 118 islands. We drew further inspiration from the organic textures and patterns of Tifaifai, the woven, patterned garments found in Polynesia along with gorgeous imagery from the islands, showing their majestic beauty. Words we used to drive our designs included “exhilarating,” “humble spirit” and “generous,” all direct reflections of the people and places that make up The Islands of Tahiti. Appropriately, blue is the brand’s primary color, inspired by Tahitian tattoo ink, illustrating the powerful and mystical Mana of Tahiti. We used green to contrast the blue and represent a richness and beauty of the region’s diverse landscape and flora. We developed new pages that provided relevant, highly-searched information as part of the SEO strategy, which we executed in two ways. During the site redesign, we optimized copy on each island’s landing page, helping distinguish the smaller, overlooked islands from the more visited ones. This not only helped with organic rankings, but showed potential travelers the diversity of culture and experiences a visitor to Tahiti can experience. We also crafted an ongoing series of blog posts for the islands, targeting specific search phrases or commonly asked questions about the islands, such as “How long does it take to fly to Tahiti?” All of these content initiatives contributed to significant increases in organic site traffic. Accompanied by stunning imagery, the content showed potential visitors that there is a perfect island to fit any mood. Noble then consolidated each of the regional domains (.fr for France, .ca for Canada, etc.) into a single, consistent look and feel while still appealing to a geographic niche. Content siloing further helped deliver content in a more impactful way to visitors. In the end, we launched 18 regional sites for The Islands of Tahiti in a variety of languages and locations from Asia to South America and all points in between. Finally, there was the issue of stakeholder businesses needing more control over their content. For this, we turned to Simpleview, a Customer Relationship Management platform that gives The Islands of Tahiti the ability to maintain a single data source which is automatically updated on the website. This helps reduce duplication of efforts. Each stakeholder – from tour operators to guesthouse owners – can now log in and manage its own content and have it deployed across all 18 sites. Tahiti is unique in another aspect: all vacations must be booked through officially approved travel agents. With the ability manage more of their content, these agents can better target potential visitors by offering specialty vacation packages such as golfing, diving and sightseeing experiences. From a search standpoint, our Strategic Services team worked through an extensive SEO process to gain additional exposure to potential visitors at various stages of the buyers’ journey, allowing for a more personalized planning experience for those considering a trip to The Islands of Tahiti. Since launch, the site has provided an updated, responsive user experience that reflects the needs of stakeholders and prospective visitors alike. Site conversions are up across the board, including organic and social, while the site’s technical SEO health score has improved dramatically. Best of all, TahitiTourisme.com has seen a 344 percent increase in goal conversions YoY.